How has sociology evolved over the last 40 years? In this paper, we examine networks built on thousands of sociology-relevant papers to map sociology’s position in the wider social sciences and identify changes in the most prominent research fronts in the discipline. 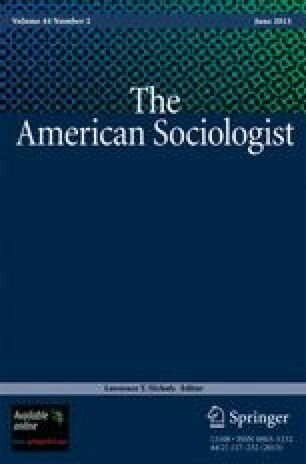 We find first that sociology seems to have traded centrality in the field of social sciences for internal cohesion: sociology is central, but not nearly as well bounded as neighboring disciplines such as economics or law. Internally, sociology appears to have moved away from research topics associated with fundamental social processes and toward social-problems research. We end by discussing strategies for extending this work to wider science production networks. Associate professor of sociology at Duke University. He has published broadly on the dynamics of social networks, and is currently working on questions related to the evolution of science networks and network diffusion. He can be reached at jmoody777@soc.duke.edu. Ryan Light is a Ph.D. candidate at The Ohio State University. His dissertation focuses on the structure of scientific networks and its effects on knowledge production. Earlier versions of this paper were presented at the 2005 American Sociological Association meetings and colloquia at Duke University, Indiana University, UC-Irvine, and UC-Santa Barbara, and we thank the participants for many fine comments, with special thanks to Lisa Keister. Work on the clustering algorithm used here is partially funded by NIH grants DA 12831 and HD41877 and NSF grant 1TR/SOC-0080860.